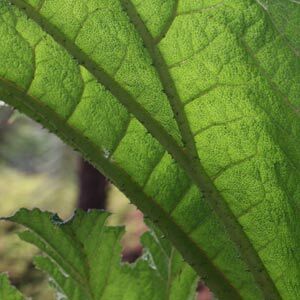 If you are looking for texture in a landscaping plant then Gunnera manicta has the foliage that will impress. It does require some moisture, however is well worth the effort. Usually sold when dormant by wholesale nurseries. Being one of the most impressive foliage plants available, landscapers should make more effort to create conditions suited to its need. Some simple irrigation from spring through summer and a water retentive soil will do the trick. Gunnera manicta is known as the ornamental rhubarb and is used in landscaping for the large textured foliage from spring through to autumn. A spectacular plant when in full growth it is originally from South America. In Australia it will grow well in most tropical to cool temperate climates as long as it has access to adequate soil moisture. Clump forming te foliage can be almost 2m across on tall stems. Dying back in winter it does like pond margins and boggy soils however can be successfully grown in any consistently moist soil. Drip irrigation will be sufficient in many cases. Wholesalers offer smaller plants, potted or bare rooted depending on the season.